I actually got off work early enough today to be able to cook dinner for myself and my husband. I absolutely LOVE LOVE LOVE to cook. I love looking for recipes, going shopping for the ingredients, and then making a HUGE mess in my kitchen while I cook. My husband loves my cooking, but he most likely would be happier without the huge mess afterwards… I seriously somehow manage to dirty at least 95% of the pots, pans, and dishes. I honestly don’t know how it happens. But anyways enough about that. On to the food! 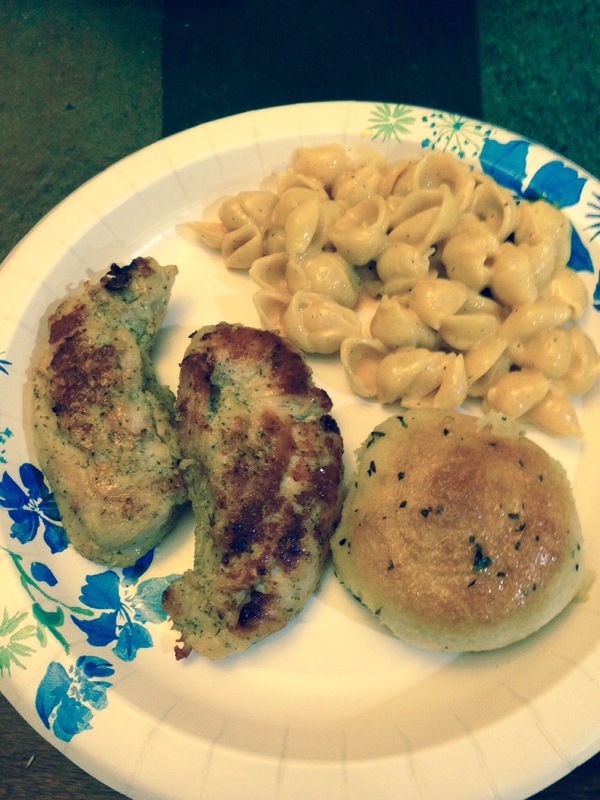 I made Ranch chicken, mac and cheese, and rolls with the special herb butter that I made. It was wonderful. Excuse the paper plate, we tried to dirty less dishes tonight. Makes clean up a lot easier. What are you having for dinner? Or what did you have? Comment below if you’d like to see a recipe for the chicken or the herb butter I made tonight.